One fine day we struck tents loaded on trucks and went to the Nancy area of France. Almost the exact spot where the 26th Division had ended up when WWI ended. We moved into the front line at night, which naturally made things more interesting. Stumbling around in the dark, trying to settle down in a foxhole that two other guys had just vacated was a little disconcerting, to say the least. Settle down we did, however, and stayed there in a holding action for about a month. Our position was out ahead of the general line so we had to wait for the rest of the line right and left to catch up to us. During this time, we were sending out reconnaissance patrols at night. I say 'we' advisably because I never went on one. Our leaders had been advised to not send out nearsighted soldiers on night patrols because frequent flares that were sent up by both sides made great reflections on the eyeglasses of these fellows and endangered the whole patrol. I wasn't anxious to run around out in front of the line at night anyway, so I didn't argue. Not at first anyway. To sort of even things up our leader assigned me, and another bespectacled Soldier, to man a listening post about 50 yards out in front of the line. When our buddies went out on patrol we accompanied them as far as that listening post (a hole in the ground) and stayed in the listening post for the night. The idea was that if we heard a German Patrol coming toward our area, one of us was supposed to hurry back to the line and notify our leader. Some of those nights were the longest I can remember to this day. For one thing, the other guy snored like an elephant. We were in an L-shaped hole, the long section big enough to lie down in and the short section for one to stand or sit and watch out. We would take one or two hour shifts and try to get a little sleep through the night. He would no more than lay down when he started to snore at a volume that seemed to reverberate for hundreds of yards. I would nudge him with my foot and he would turn over and stop for a while, but was soon back at it again. LLLLOOOOOOOONNNNNGGGGGGG nights. I remember one night we were out there, when for the first time I heard someone rustling through the long grass out in front. We both listened and we could hear them intermittently advance a few yards and then stop and be very still. After a few minutes they would advance a bit more and stop again. We were deciding which of us would run back to report this enemy patrol when we heard a little different noise and with relief recognized the snort of a cow that had wandered into our area and was grazing, walking a few steps and stopping to munch on the grass. There were always a few stray cows wandering around out to our front and occasionally getting blown up with mines. Another night five Yugoslav resistance fighters came up to our line and almost got cleaned out because they had come to the wrong area. 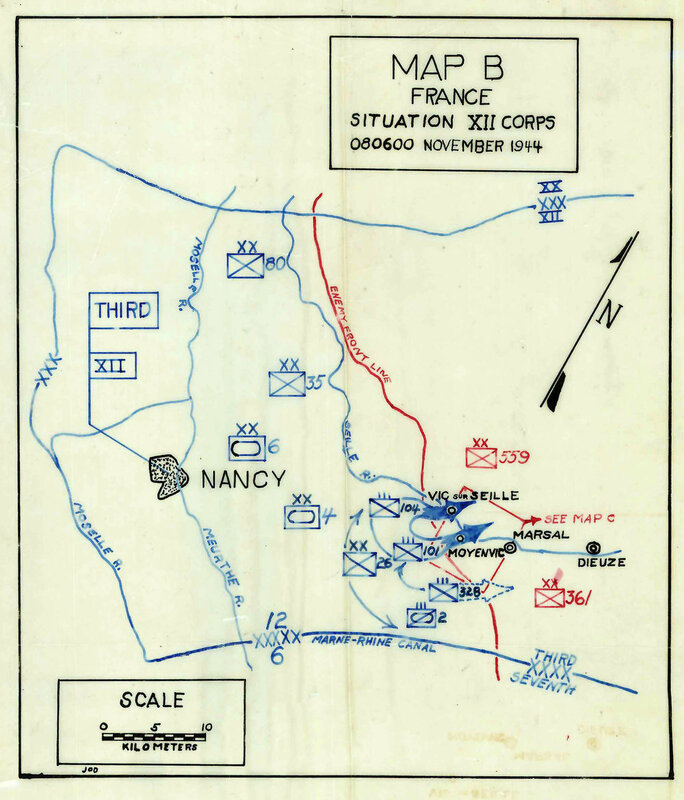 They had been told how to pass through the German line and that they would be expected on a specific night to come up to our line at a specific location. They got lost and came to the wrong spot and were very lucky to have not been shot. Although we were just in a holding position, we were being shelled regularly by the enemy artillery and some mortar fire. They scored a direct hit on a hole not far from ours and the two occupants were killed, they were really scrambled. Their neighbors wanted to just leave them and fill in the hole, but those in authority said no, what was left of them must be gathered up, and put in shelter halves (each man carried half a pup tent), and brought to the rear. That was a duty that I am glad I did not have to participate in. 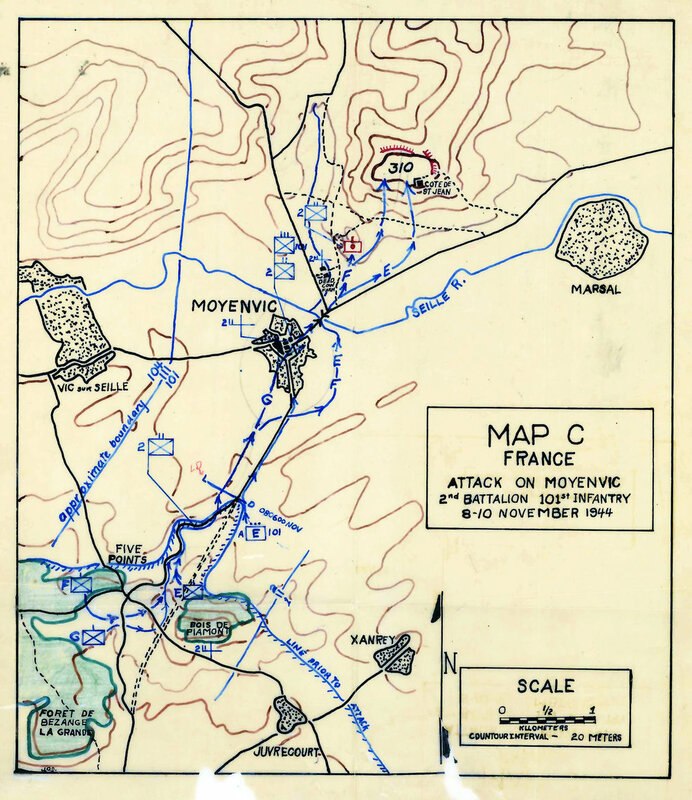 After a month or so of holding we finally got orders to attack and were assigned an objective to take Hill #310 around the village of Moyenvic. We were scheduled to move out early in the a.m. at first light and were carrying light packs, K rations, raincoats, entrenching tools and mess kits. These maps show the location of the companies of the Second Battalion of the 101st Infantry Regiment on November 8, 1944. A Battalion officer who was part of the action that day, John Osbourne Dickerson, would survive the war and go on to attend the Advanced Infantry Officer's Training Course at Ft. Benning in 1947-48. He wrote a paper about the attack on Moyenvic and Hill 310. The maps above are part of his report. Needless to say, I was not enthusiastic about the promotion. I learned that our company was on the far right of our organization and our squad was on the far right of the company so when we moved out our job was to first move parallel to the line and make contact with the outfit to our right. This was quite a relief to me and I liked the idea of heading in that direction rather than straight out front. My relief at heading to the right flank instead of forward on our first real attack was short-lived. We hadn't gone more than a hundred yards or so when an enemy rose up in front of us and started spraying us with a Schmeizer machine gun or 'burp gun' as we called them. We hit the ground and I, for one, just tried to get closer to the earth without returning fire immediately. What did happen immediately was that they started throwing in artillery or mortar fire (or both) on us. I figured that we had had it.